This spectacular estate diamond anniversary wedding ring will be adored for a lifetime. High quality bright, white diamonds disperse beautiful prismatic rays of light in this lovely ring. This ring has 3/4 carats of diamonds with great color and clarity (apx 3/4 ct tw, E - G, VVS2 - VS2). Horizontally mounted straight baguette diamonds alternate with round brilliant-cut diamonds to form a very stunning ring . This estate platinum diamond anniversary ring is made in platinum. 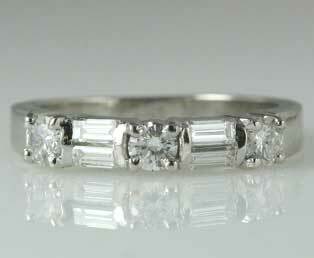 Platinum is long known to be the most durable jewelry metal, that will continue to stay white.